We’d love your help. Let us know what’s wrong with this preview of Dark Hunger by Demetrius Sherman. Peter Sunday must face a danger that fists, bullets or brains won't stop. Usually the private investigator handles whatever comes his way. Nothing stops him from locating missing people. But when bizarre events occur, Sunday is led to believe its unlikely he'll live long enough to find anyone. To ask other readers questions about Dark Hunger, please sign up. DARK HUNGER is a book about a former cop who opens a private investigation business. He has an exceptional amount of people coming to his office in search of loved ones who have disappeared. It is the investigator’s job to find out where these people are going to and what is causing their disappearances. The book reveals interesting cases, as the private investigator searches for clues that lead to the culprit. Sherman is a talented writer with a good grasp of flowing dialogue. He has a grip on c DARK HUNGER is a book about a former cop who opens a private investigation business. He has an exceptional amount of people coming to his office in search of loved ones who have disappeared. It is the investigator’s job to find out where these people are going to and what is causing their disappearances. The book reveals interesting cases, as the private investigator searches for clues that lead to the culprit. This is an action-packed book written by a promising writer. It is a quick read. However, some readers may need more time getting to know the characters. Often, readers crave contradictions, foibles, and fears in characters before characters become heroes and save the world. Dark Hunger was a good vampire tale but I felt the lack of character development and 'clumpy' writing style let it down. I guess only so much 'fleshing out' (excuse the pun) can be squeezed into a novella of just 134 pages, so I'll let that pass. The writing is badly in need of a further edit and at times left me scratching my head in frustration as to how so many bloomers weren't picked up on. Moving forward, I did enjoy the story and, in places, it was very original - the 'light weapon' being a Dark Hunger was a good vampire tale but I felt the lack of character development and 'clumpy' writing style let it down. I guess only so much 'fleshing out' (excuse the pun) can be squeezed into a novella of just 134 pages, so I'll let that pass. The writing is badly in need of a further edit and at times left me scratching my head in frustration as to how so many bloomers weren't picked up on. Moving forward, I did enjoy the story and, in places, it was very original - the 'light weapon' being a great addition. The creepiness of the Janus Gold building was excellently portrayed, as was its inhabitants. Overall, with some minor adjustments, this could be a great vampire short story. Thanks to author Demetrius Sherman for a copy of this book in exchange for an honest review. "Dark Hunger" is the first book I have read from Demetrius Sherman, and I was enthralled from the first page. I haven't come across any "cross genre" reads about vampires and Private Investigates to date, and blended, it makes for an interesting read. Written in a fast paced novella format, it's compacted with action, crime and of course, blood sucking vampires. 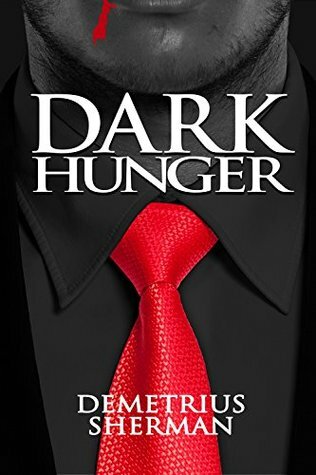 In addition, "Dark Hunger" has the great combination of both a strong character, Peter Sunday, in a rough, old fashioned ex-cop turned P "Dark Hunger" is the first book I have read from Demetrius Sherman, and I was enthralled from the first page. I haven't come across any "cross genre" reads about vampires and Private Investigates to date, and blended, it makes for an interesting read. Written in a fast paced novella format, it's compacted with action, crime and of course, blood sucking vampires. In addition, "Dark Hunger" has the great combination of both a strong character, Peter Sunday, in a rough, old fashioned ex-cop turned Private Investigator, and an original story line, with vampires that are sucking bodies dry of their blood all over town vs P.I.! You can't help but grow to like P.I. Sunday, who try as he might, is good at regular private investigative work, yet takes a while to come to terms with anything outside the traditional, like the supernatural killers. As the vampire conspiracy continues to parallel his world, and draw P.I. Sunday in further, it will become very personal once a death close to home occurs, and more bodies starts piling up around him. Also, I like the originality of the weapon, a light diffusing type weapon, that kills vampires with an infuse of bright light. But will it be enough, taking on new killers P.I. Sunday knows nothing about? This is the first book I have read by Demetrius Sherman. In this book Pete is a former cop who is now a private investigator who just received several requests to find missing people. He finds out that the Janus Gold company is the common indicator from an newspaper ad. While I enjoyed the book, I found myself skimming some of the pages as it was not very compelling. It did not "pull" me into the story like some books I read. It is a quick read and I did enjoy the story though. Demetrius Sherman's novella offers a solid supernatural thriller, where the clues to the supernatural elements are laid early in the plot, allowing the reader to watch Peter stumbling closer and closer to the heart of the mystery while remaining completely oblivious to the danger. While I didn't find the way the characters were written made me particularly sympathetic towards them, and in many places the writing got in the way of the story for me, I did find that contrast between the supernatural clues and the detective fixated on finding a normal explanation was an interesting, well-structured aspect to the story. Overall, despite feeling that the characters could benefit from more development, Dark Hunger certainly shouldn’t be dismissed, especially for thriller and suspense readers. I love, love, love private investigator stories. When you combine a PI with the horrific murders that Stephen King would write, you have a book (novella, in this case) that really intrigues me. Mr. Sherman knows how to make his work short and sweet, without unnecessary filler text and scenes, which I really respect. Not many authors know how to do this today. He writes investigative fiction very well, you can tell he is a fan of Sir Arthur Conan Doyle, but by no means does he copy him. This book I love, love, love private investigator stories. When you combine a PI with the horrific murders that Stephen King would write, you have a book (novella, in this case) that really intrigues me. Mr. Sherman knows how to make his work short and sweet, without unnecessary filler text and scenes, which I really respect. Not many authors know how to do this today. He writes investigative fiction very well, you can tell he is a fan of Sir Arthur Conan Doyle, but by no means does he copy him. This book is very unique, very fast and not so gruesome that fans of investigative fiction would turn up their noses, and not so technical that horror fans will be bored. He walks the line very cleanly between the two genres. I wish I could've gotten this review up sooner, because I have actually read this twice since receiving it, haha! It was fun and very interesting. While there were moments that could have used edits (just a few repeated words, means nothing to me but the technical of my readers might want it mentioned), I found little fault in this novella. In Demetrius Sherman's latest novella, he takes on the character of Pete Sunday. Pete is a former cop who is now a private investigator. While Pete has recently received several requests to find missing people, he questions what all of the disappearance have in common. There are also several murders happening around the city and each of the bodies are showing up without any blood. Pete takes on the case to fins several people who have gone missing after going to the company Janus Gold to fulfill In Demetrius Sherman's latest novella, he takes on the character of Pete Sunday. Pete is a former cop who is now a private investigator. While Pete has recently received several requests to find missing people, he questions what all of the disappearance have in common. There are also several murders happening around the city and each of the bodies are showing up without any blood. Pete takes on the case to fins several people who have gone missing after going to the company Janus Gold to fulfill an ad offering wealth to anyone who applies. While not only Pete suspect the company is liable for all of the disappearances there is little proof to link the company to the missing and also the murdered. While Pete is trying to gather information on Janus Gold, his informants either end up dead or missing. Eventually Pete must face what is inside the Janus Gold company, and what he finds will change him forever. As you can imagine by the cover, this story has our beloveds “blood suckers” in it. This is a short but exciting story with mystery and action in it. Dark Hunger presents Pete Sunday, a private investigator, ex-police officer, hired by a woman to find her son. While he works on this case he finds himself wrapped up in more cases. A murdered journalist, dead bodies founded everywhere and a strange company behind it all. Being a short story it has a fast rhythm and the chapters fly by one after the As you can imagine by the cover, this story has our beloveds “blood suckers” in it. This is a short but exciting story with mystery and action in it. Being a short story it has a fast rhythm and the chapters fly by one after the other. Nevertheless, the intrigue and the suspense are present all the time. Word by word we discover along the main character a secret and dark world, hidden under false promises. I don’t want to spoil anything because so much happens in the story but let me tell you that is so attractive and fast that you will read it in just a few minutes or less than an hour. Overall, this is a well written and engaging story for all mystery lovers. A change of direction from Mr Sherman as he switches his location and characters from Victorian England to the dark side of present day urban America. Corporate wrongdoing, rapacious vampires, a remorseless detective, together with a taut plot and dialog make this the best of Mr Sherman's books - so far. I look forward to the sequel. Hammett, Chandler, and Conan Doyle were among the fiction Demetrius Sherman read growing up. These works were excellent seeds in the creation of the fast-paced Sheridan Hope Thrillers and the vampire thriller Dark Hunger featuring private eye Peter Sunday. His other work includes a suspenseful horror tale titled The Hunters and the satirical Food Police.